Pizza enthusiasts know well that a simple u-shaped curvature at the crust can keep a thin slice from drooping over when lifted from a plate. A team of engineers from Brown University has shown that fish may take advantage of roughly the same dynamics to stiffen their fins for swimming. Using a mathematical model and the mackerel pectoral fin as an illustrative example, the researchers show how fin stiffness may be changed by applying a u-shaped curvature at the fin's base. The effect, the researchers say, might underlie the ability of fish to swim at widely varying speeds in all kinds of currents with great maneuverability. "One way to become more maneuverable is by having the ability to generate varying amounts of force on the water when flapping a fin," said Shreyas Mandre, an assistant professor in Brown's School of Engineering and a co-author of the research. "We think that fish modulate curvature at the base of the fin to make it stiffer or softer, which alters the force they generate on the water, which in turn may underlie some of their maneuverability." The research was conducted in collaboration with Khoi Nguyen and Madhusudhan Venkadesan from Yale University, Ning Yu from UCLA and Mahesh M. Bandi from Okinawa Institute of Science and Technology. It is described in the Journal of the Royal Society Interface. Generally speaking, the researchers say, it's been assumed that the stiffness of these fins is calculated by the bending rigidity of each bone multiplied by the number of bones. But that simple picture ignores mechanical interplay between the bendable bones and the elastic skin, which could produce vastly more stiffness than the simple model would suggest. That interplay also turns out to be the mechanism through which fish change a fin's stiffness via curvature at the base. The researchers looked at micro-CT scans of bone arrays in mackerel fins, which are broadly representative of ray-finned fish. They showed that the bones' shape makes them bend more easily in particular directions, and that each bone's "preferred" bending direction is misaligned slightly with respect to adjacent bones. According to their mathematical mode, this arrangement means that when a force is applied across a fin, the bones bend collectively in a way that causes them to splay apart. However, that splaying motion is resisted by the elastic tissue that lashes the bones together, and it's that resistance that stiffens the entire fin. The way in which this architecture transmits forces is broadly similar to the way in which forces are transmitted in a slice of pizza that is curved at the crust and becomes more rigid along its length. Only in this case, the effect of the curvature is "baked in" to the fin, meaning it has the mechanical benefits of a curve even when it is flat. Applying an actual curvature at the base of the fin would magnify the rigidifying effect. "So by adjusting curvature, fish could quickly and dramatically alter how hard they could push on the water, which could make them more maneuverable" Mandre said. 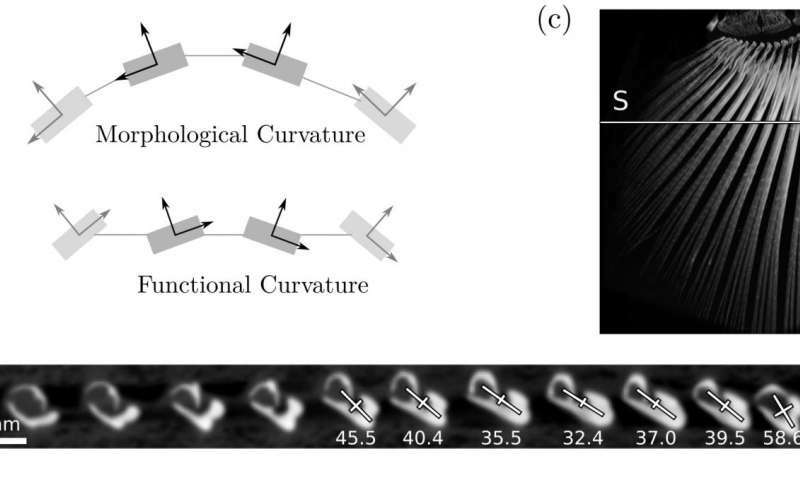 "These results help us to understand the functional significance of curvature in fish fins," Mandre said. "In that way, it gives a design principal we can potentially use for developing robotic appendages for highly maneuverable aquatic propulsion."